Sometimes, you just have to give in to the hype and read the book that everyone is talking about. Hyped books do make me a little nervous because there is suddenly all of this extra pressure before you’ve started reading it. Does that make sense? Does anyone else feel that way about books that are getting all of the attention? Scythe is set in a world in which mortality has been conquered. The only way to die is to be gleaned by a scythe, professional and societally approved killers. They are revered and feared, a mystery to everyone who isn’t amongst their number. Citra and Rowan are some of the few who are allowed a peek at what it is really like to be one when they are chosen to be apprentice scythes. There, they discover that things aren’t as simple as society believes and that being a scythe could be even more dangerous than they ever thought it could be. Corruption is everywhere. What follows is a tense read, that will keep you hooked through every twist the characters lead you down. Though set in a seemingly perfect world, there is something in it that makes you uneasy, waiting for the curtain to be lifted so you can see just what is going on. That sense of discomfort never quite leaves you as Shusterman expertly gets under your skin, leaving behind a hundred little what ifs. This is all carried by a wonderful cast of characters. None of them are perfect, but they are all wonderful. Even the ‘bad guys’ are so brilliantly created that you can really understand the steps that have led them to this horrible action. 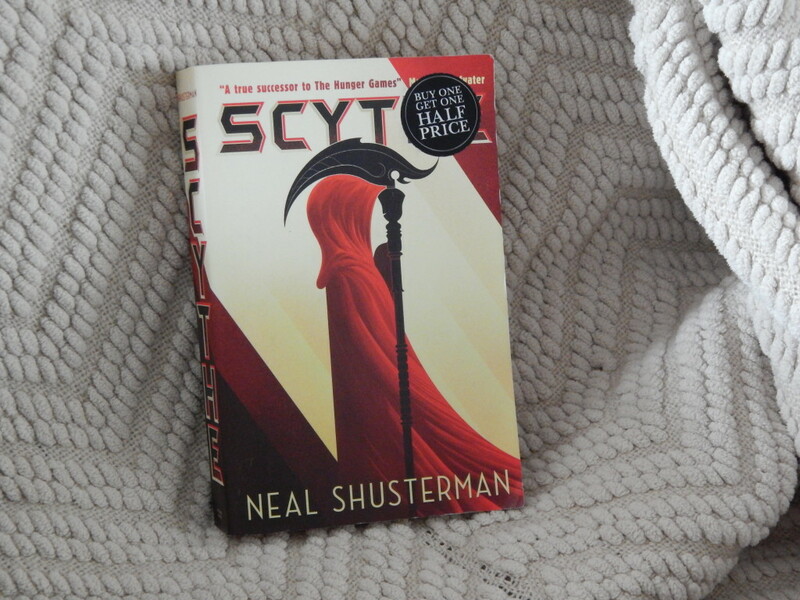 In fact, Shusterman really revels in the grey areas between good and bad in Scythe, and this is one of the things that help elevate this novel from good to great. In a world where every problem has been solved, nothing is allowed to be simple. I’m hoping to see this pushed even further in the sequel to Scythe, which I think is out now. I’ve had this on my TBR for ages and now on my bookshelf for six months… and I just haven’t taken the leap yet. I love your review – it’s a bit reassuring to hear about how well-crafted the characters are. I definitely read books for good characters, and I’m looking forward to it even more now!